You can follow the no less famous Alsatian wine route aboard your houseboat or go exploring the landscapes of the Vosges mountains. 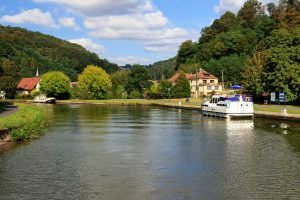 What with the region’s gastronomic delights and the Alsatian sense of hospitality, you can gear yourself up for an unforgettable holiday if you opt for a waterway cruise in Alsace. Pick up your cho­sen house­boat in the pic­turesque town of Wal­tenheim sur Zorn for an unusu­al and orig­i­nal hol­i­day. Set off in your desired direc­tion, between the plains of Alsace and the Vos­ges mas­sif, as you take to the Marne-Rhine or Rhone-Rhine Canal aboard your licence-free boat. This is a land of exchange and com­mu­ni­ca­tion, a region steeped in trea­sures, so pre­pare to explore every cor­ner of this liv­ing her­itage aboard your house­boat. Take the time to moor up along the way and wan­der the vil­lage mar­kets or eat at one of the many Win­stubs – tra­di­tion­al Alsa­t­ian restau­rants. The region’s gas­tron­o­my will be an impor­tant part of your Alsa­t­ian water­way cruise. Tarte flam­bée and sauer­kraut, pies with blue­ber­ries or mirabelle plums, Lor­raine pâté… life aboard your licence-free boat will be a real for­ay into Alsa­t­ian gas­tron­o­my. Treat your­self to a weekend’s immer­sion in a land dot­ted with half-tim­bered build­ings and admire Hansel and Gretel’s house, locat­ed just a few metres away from Les Canalous’ base in Wal­tenheim sur Zorn. If you have the oppor­tu­ni­ty, extend your enjoy­ment by going through a few more locks to explore the region­al cap­i­tal, Stras­bourg, or expe­ri­ence the unique inclined plane of Saint-Louis-Arzviller. Trav­el­ling through the locks will be great fun for all mem­bers of your crew and vis­it­ing this ver­i­ta­ble ele­va­tor for boats will be one of the unfor­get­table moments of your cruise. Strasbourg’s his­tor­i­cal her­itage will be a source of aston­ish­ment and won­der for you all. In between, there’ll be ample ideas for off-road cycling trips, as well as breaks to take advan­tage of the region’s numer­ous lakes and rivers. Treat your­self to a swim or laze by the beach in the Alsa­t­ian sun. This is all part of the mag­ic of a water­way cruise in Alsace – a chance to sim­ply get away from it all ! 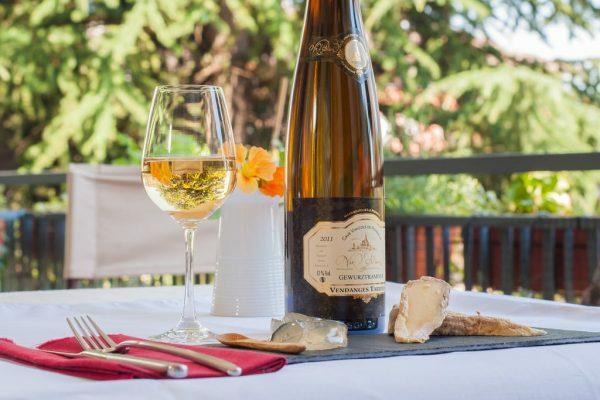 1 / 4 Alsatian cuisine on the water Even on your rental houseboat, you’ll be able to take advantage of an Alsatian highlight as you get close to Alsace’s famous wine route. Pinot noir, Riesling, Gewurztraminer, .... navigate your way to the vineyards that have made the region famous and treat yourself to winery and cellar visits as you stop off along your route. If you can, take a foray into the traditional markets, seeking out some local products to bring back on board. You can also enjoy eating in Alsace’s traditional Winstub restaurants. Sauerkraut, baeckeofe, flammenkueche, ... savour all the traditional recipes, served in a unique atmosphere. 2 / 4 Willer mill – the Sarre’s exceptional heritage Although it has undergone many changes and transformations over the centuries, Willer mill remains a unique example of waterway heritage. Built on the Sarre at the beginning of the 18th century, it invites you to discover the region’s traditional know-how. Your whole crew will love watching the wooden waterwheel turn with the force of the water. The wheel, with its 108 blades and 5-metre diameter, is a unique spectacle in motion. Admire all this know-how as you watch the mill and miller at work and extend your enchantment even further by sampling the bread or flammenkueche on offer at the heart of Willer mill. 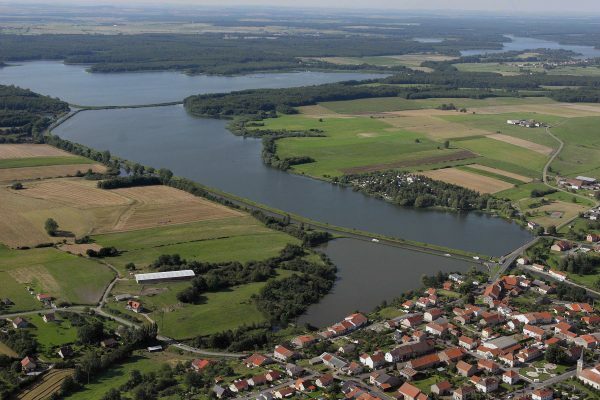 3 / 4 Gondrexange Lake – a fishing paradise Aboard your licence-free rental boat, on both the Marne-Rhine Canal and Canal de la Sarre, you’ll be able to navigate your way to Moselle, a land of lakes. Here, you can delight in a whole series of pools and lagoons, with every stopping point giving your youngest boaters the opportunity to enjoy a swim, as well as all kinds of other water activities. You can moor up on the banks of Gondrexange lake, which was developed in the 14th century and used, in particular, as a fishing reserve for the Region’s abbeys. It’s now a key meeting place for fishermen and women, so why not leave your licence-free rental boat for a few hours and really make the most of it? 4 / 4 Saint-Louis-Arzviller inclined plane The Saint-Louis-Arzviller inclined plane is sure to be one of the essential stages of your waterway cruise in Alsace Lorraine. 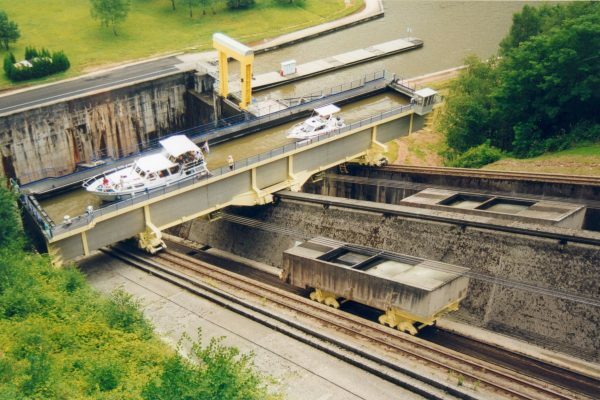 The building, inaugurated in 1969, has allowed no less than 17 locks to be replaced on the route between Strasbourg and Paris, cutting down a barge’s journey by a whole day. You’ll be able to take advantage of this lift to overcome a height difference of over 44 metres in less than 4 minutes. The sheer scale of the structure contrasts with the calm and tranquillity that reigns here and, aboard your rental houseboat, you’ll enjoy a unique experience as the trolley transports you up a 41 % slope. From Languimberg - Port du Houillon Languimberg is an ideal starting point for a weekend or week away with friends or family if you’d like to indulge in the pleasures of waterway tourism.